Wifi is available throughout the guest house. The password is provided at check-in. Each room has an HD television with a wide selection of DSTV channels. Linnen and towels are provided troughout – including pool towels in summer. Rooms are serviced daily with linnen and towels changed every four days for longer stays. Breakfast is served on the patio or in the dining room. Weekdays: 7 to 9 am; Weekends: 8 to 9.30 am. An outdoor swimming pool provides relief from the heat in summer. The shared dining room is equipped with a fridge/freezer, microwave oven, toaster and kettle. Guests also have access to crockery and cutlery so that they are able to prepare snacks or light meals. The shared lounge provides a quiet comfortable space in which guests can enjoy the coffee table books on display or a glass of wine by the fireplace on a cold winter’s night. 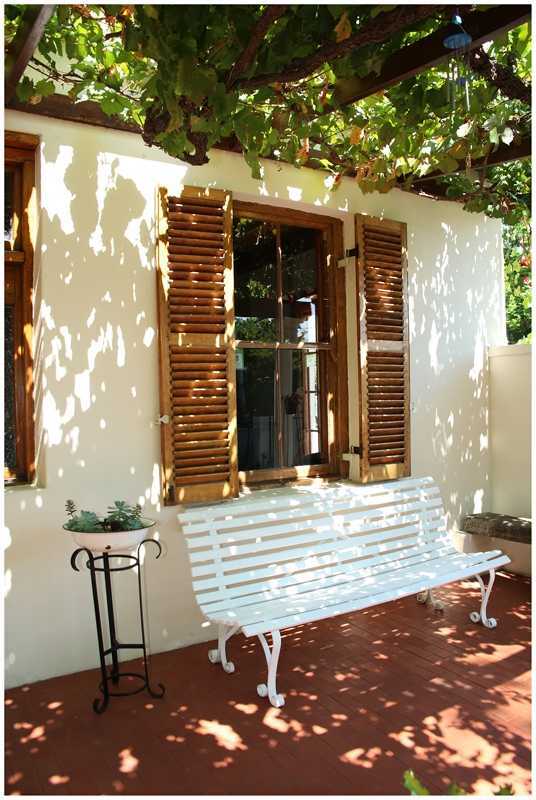 A lovely vine-covered patio is the perfect place to take breakfast, sip a sundowner while taking delight in the garden and its many visitors. As it matures the garden becomes more and more of an attraction – for guests and natural visitors alike. A leafy canopy makes it a wonderfully cool space in summer.